This is a pearly very very very light gray. You can see in the bottle that it has gorgeous veins of silver shimmer running through it, but the polish is so opaque that you can’t much see it on the nail. Yes, this polish is SO OPAQUE. Possibly one-coater, here, people. How crazy is that for an almost-white polish?? This dries in an entirely different shade than it looks in the bottle. The bottle is a light yellowish brown, but on the nail it becomes sort of a darker purplish taupe. Really nice, and again – with careful application this could be a one coater. This one is extremely pigmented but has sort of a jellyish finish. It’s very very bright red. 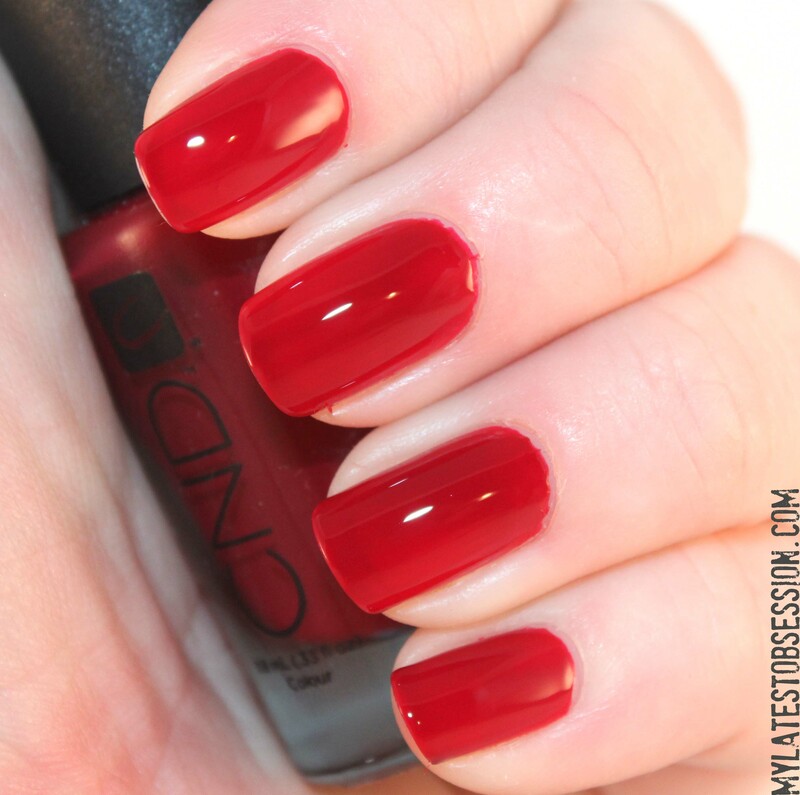 The interesting thing about this polish is that it’s totally easy to apply evenly and smoothly – how many times have we all used a jelly polish that took 3-4 coats to get even and by that time most of the see-through jelly qualities were gone? This is a one or two coater. Really nice light mauve color, but it’s too close to my skin color for my liking. I will keep it around for job interviews and such though. The formula on this one was still beautifully smooth, but not quite as pigmented as the others. Aaaaaand, here’s the Anna tweed topcoat. It’s super difficult to show the effect in photos because it’s pretty subtle, but it’s a mild matte finish with hairs. Yeahhhh, that doesn’t sound too good, does it? Well, that’s because it’s not. 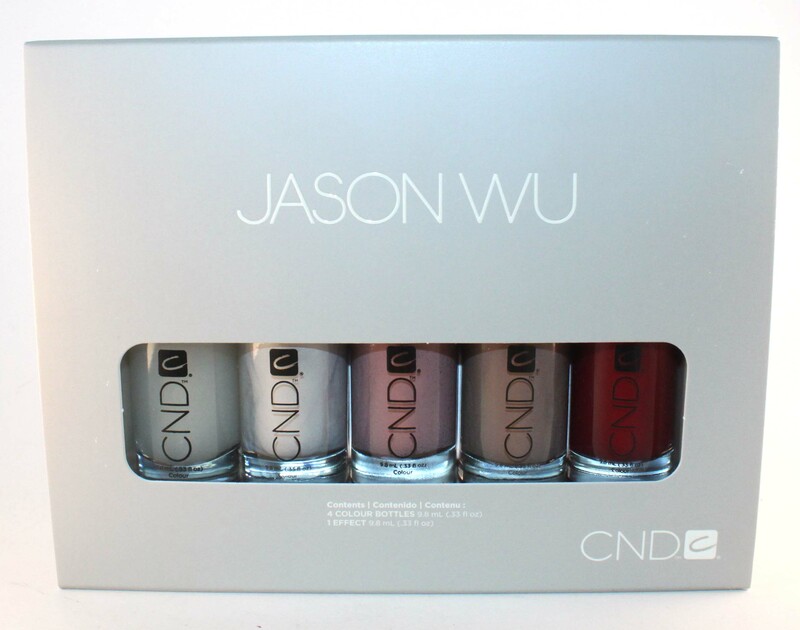 I applaud CND (or Jason Wu, whatever) for getting creative with their Effects topcoats, but this is just bad imo. It…looks like sheet marks to me, just messy, sloppy nails. Also, the hair-thingys stick off the end of the nail, as you can see in my photos below. Adding normal topcoat pretty much erases the effect, by the way. It…does remind me of tweed, though. I just don’t think that nails that look tweedy/fuzzy are a look I am after. This is just so subtle, and when my nails catch my eye my first thought is “OH NO, I messed up my nails! !” That’s probably not the intended reaction. I’m probably missing something really obvious here, but I can’t figure out who this polish is named for. The others, I assume, are Brigitte Bardot, Veronica Lake, and Sophia Loren…but I can’t think of an Anna! OK, my thoughts on the collection. As a collection, it’s fabulous. The colors look great together and are gorgeous in the box, and the Effect topcoat is an interesting concept. As individual polishes, the colors are somewhat trendy but somewhat safe – they’re not especially groundbreaking. The formulas, however, are top-notch, some of the best I’ve ever used. It might sound like I’m disappointed in this collection, but I’m really not – I’m glad to have it and it’s actually made me want to buy some other random cremes from CND because of that insanely smooth and opaque formula. I will also continue to buy all the Effects, because even though I think Anna was kind of a miss, I still really adore the concept and the implementation for most of the others. I kind of think that she might be the most likely option. Anna Wintour would make sense too but…she doesn’t really fit in with the rest. Miss Wu is awesome. It reminds me of the Bourgese nail polish i saw once didn’t buy and never saw again )= That Anna top coat does resemble sheet marks, but it’s interesting. I can’t say I dislike it. “Anna” might be pioneering Asian-American actress Anna May Wong. Pity, because I never thought of her as particularly hairy. The colors are really nice but the texture of the top coat just gives me the shivers. hmmm, I hadn’t thought of that. The shades are nice though, but the effect doesn’t look that pretty, you’re right ! ugh, I wondered that, but she isn’t quite in the same category as Sophia, Brigitte, Veronica, so I figured it must be someone else.